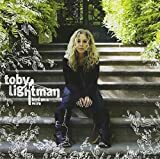 Toby Lightman seems like a very talented and overall a good artist. Her first album Little Things was great album; it was innovative and expressive. Too bad it seems she's lost some of her magic as Bird on a Wire just seems to be missing some of her old charm and lyricial talent. The album has some great songwriting and music although it reminds me of a watered down Sheryl Crow album which isn't too inspiring or interesting to me. Some highlights of Bird on a Wire are Overflowing, Alone, and Holding Me Down.